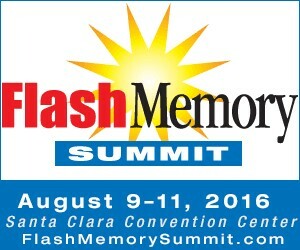 Next week, storage experts will gather at the 2016 Flash Memory Summit (FMS) in Santa Clara, CA, to discuss the current state of flash memory applications and how these technologies are enabling new designs for many products in the consumer and enterprise markets. This year’s program will include three days packed with sessions, tutorials and forums on a variety of flash storage trends, including new architectures, systems and standards. NVMe technology, and its impact on enterprise flash applications, is among the major topics that will be discussed at the show. The growing industry demand to unlock flash storage’s full potential by leveraging high performance networking has led to the NVMe community to develop a new standard for fabrics. NVMe over Fabrics (NVMe/F) allows flash storage devices to communicate over RDMA fabrics, such as InfiniBand and RDMA over Converged Ethernet (RoCE), and thereby enabling all flash arrays to overcome existing performance bottlenecks. NVMe over Fabrics Panel – Which Transport Is Best? Representatives from the IBTA will join a panel to discuss the value of RDMA interconnects for the NVMe/F standard. Attendees can expect to receive an overview of each RDMA fabric and the benefits they bring to specific applications and workloads. Additionally, the session will cover the promise that NVMe/F has for unleashing the potential performance of NVMe drives via mainstream high performance interconnects. This informal event encourages attendees to “sit and talk shop” with experts about a diverse set of storage and networking topics. As IBTA’s Marketing Work Group Co-Chair, I will be hosting a table focused on RDMA interconnects. I’d love to meet with you to answer questions about InfiniBand and RoCE and discuss the advantages they provide the flash storage industry.